Learn how to beautifully quilt your pieced blocks with expert Wendy Sheppard. In this class, you'll learn how to select designs specifically for pieced blocks, and then successfully machine-quilt them. Do you ever struggle to decide what design is best to quilt on your quilts? Many quilters wonder how they can add visually striking designs to their pieced quilts beyond stitching-in-the-ditch and crosshatching. 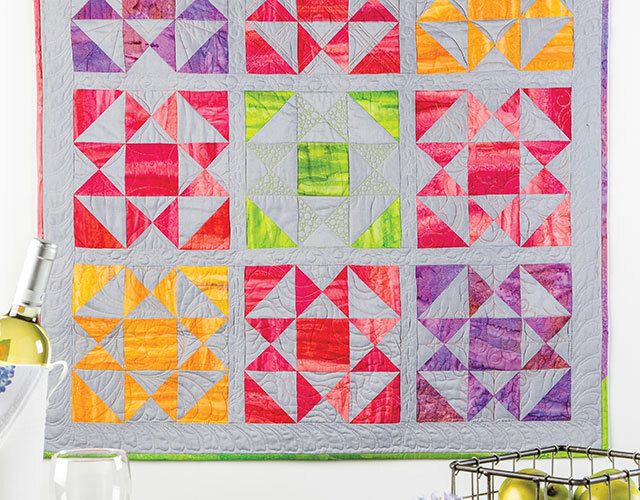 In this Annie's video class, expert quilter Wendy Sheppard shares many tried-and-true machine-quilting designs and techniques ideally suited to pieced blocks. Mark pieced blocks for easier machine quilting. Apply machine-quilting techniques to the Ohio Star block. Machine quilt straight-line designs that are not stitch-in-the-ditch. Quilt a crosshatch plaid design. Quilt within the natural geometry, or pieced patches within each block. Free-motion quilt a simple feather wreath. Create an illusion of a quilt block with machine quilting in a contrasting thread. Free-motion quilt allover motifs including sand dunes, leaves and swirls. Free-motion quilt a swirly flower motif for an art-quilt look. Class includes complete, downloadable instructions to make the exclusive class project, Sherbet Squares Pieced Quilt. Each pieced block in this quilt applies different machine-quilting designs and techniques to expand your quilting skills. I thought this class was very informative. So glad I bought it. I've always just stitched in the ditch, but this class had many ideas that I plan to try on my next quilt. catching. I'm now buying the fabrics (from Annie's) to get going on this project. This is the worst class I have ever purchased. It was not what I expected from the preview. I would not recommend it to anyone. I was very disappointed.